Gray codes are often used in positioning systems, see the wiki article for more details. I want to generate gray codes with python, and I'd like to generate all possible gray codes for a specific number of positions and number of bits. The maximum number of positions for a gray code is 2^numbits i.e. a 4 bit gray code can have at most 16 positions. It can also have fewer. If you want the gray code to be circular i.e. the first and last code have hamming distance 1, then there needs to be an even number of positions. Odd is fine if you don't care if it is circular. # vecs holds our binary vectors. # False otherwise. This will be our constraint. The main thing to note is that we add constraints so that each code has a hamming distance of 1 with its neighbour, and also that all the codes are diferent. 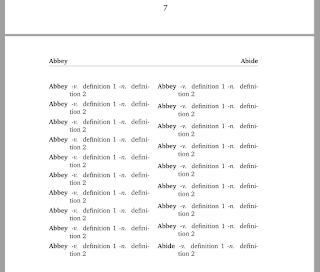 I recently needed a latex dictionary template, there are a couple around on the internet, but they are all under non-commercial licences so I couldn't use them. Fortunately it is pretty easy to make one yourself, I have provided one here. Consider it to be under the wtfpl licence. %as published by Sam Hocevar. See http://www.wtfpl.net/ for more details. % setting the page headers so that first and last words appear there. In the previous post I was generating the patterns of white and black squares. In this post I'd like to actually fill the patterns with words so that everything matches up. This sort of problem is very well suited to a constraint satisfaction solver, as it can try many possibilities until something is found that works. The trick is specifying the constraints in an efficient manner. My first solution was to implement it the same way as the magic word squares, but this was really inefficient and there is a much better way. I put the code for this on github, it's a bit messy but works: https://github.com/jameslyons/crossword_gen. 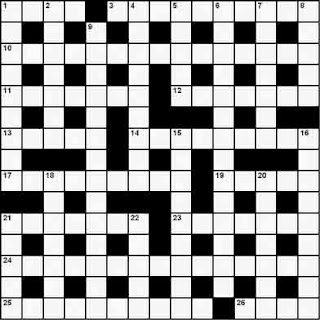 The trick is you don't need to represent all the different squares in the crossword as separate variables and put the constraints on those, your actual variables will be indexes into the word list, and the constraints will be whether e.g. character 4 of word 1 is the same as character 2 of word 7. These constraints will obviously be different for every crossword and will have to be generated each time, but this isn't too hard. The inputs from the previous step are hex strings e.g. This can be converted to a binary string by replacing e.g. 3 with '0011', same as decoding hex anywhere. The function I use is down the bottom of the previous post. This gives a binary string that can be represented as the white and black squares of the crossword. The code takes as argument the hex representation of the pattern. It first prints a representation of the crossword with 'X's where the letters go, then once it gets solved it outputs the solved crossword, along with the list of words that got used. The dictionary I am using has some weird words in it, so you need to pay some attention to that if you want nice crosswords (I recommend using something like the 3of6game.txt from the 12dicts wordlist, it is specifically for games). The final thing that gets printed is the crossword represented as a string, this is passed to some typesetting code I have that produces nice pdfs of the crosswords. . . p o o . n . n . v e g . .
. . t a g . m . l . r a t . . This takes the hex string output from the pattern generation step as an argument. It uses a wordlist called 'fewerwords.txt'. Each time it is run it should give different results because the word indexes are shuffled each time. Sometimes it will take a long time to find a solution, I suggest just killing it and running it again. Most of the time this will get a new starting point that allows it to be solved very quickly, though some patterns are just harder to solve than others. In previous posts I have been playing with python-constraint, and building crosswords is something that interests me for some reason. I decided to do it in a two step process: step 1 generate the patterns of white and black squares, step 2 fill the patterns with letters. This post will deal with step 1 only, the next post will deal with step 2. Generating the patterns is well suited to using a constraint solver since you can just specify the things you'd like to be true of the final result, then ask the constraint solver to do it for you. In this case we have e.g. 15 by 15 binary variables, we choose the constraints so that the final pattern looks like a crossword puzzle. I am interested in automatically generating patterns that look like nice crossword patterns e.g. I'd like 4-fold symmetry, because I think it looks good. No 2x2 blocks of white squares. No 2x2 blocks of black squares. No words longer than MAXLEN. No sequences of black squares longer than 3. White squares must be fully connected. Some of these conditions are pretty easy to implement with python-constraint, the fully connected constraint I can just apply to the final solutions and discard them at that point. By fully connected I mean you can get from one square to every other square in the pattern, so you can't get disjoint islands.
. . . X X X . X . X X X . . .
. X . X . . . . . . . X . X .
. . . . X . X . X . X . . . .
. X X X . . . . . . . X X X .
. X . . . X . X . X . . . X .
. . . X . . . . . . . X . . . The hex string is the binary to hex encoding of the pattern, 'X's are zeros, '. 's are ones. The hex string will be passed to step 2 which will fill in the words using a wordlist. It's pretty easy to generate a few million example patterns with this program (if you are willing to wait a day), which is what I suggest doing. Once you have a heap of patterns you can further filter them by whatever criteria you want e.g. no more than X 3-letter words, no more than X% black squares etc. Once you have the filtered list, you can try filling them with words. # any random point. True if fullyconnected, false if disjoint parts. # Could easily be made more efficient, but this works fine. The hex string is generated using the following python script (test_bin2hex.py). The extra letters are so we can encode binary strings that aren't necessarily divisible by 4. This post will deal with the seemingly boring topic of magic word squares - I define these to be squares of letters where each row is a dictionary word, and each column is also a dictionary word. In my wordlist, there are 3,641 4-letter words (I talk about how I generated the wordlist below). How many possible 4 by 4 word squares do you think there are? Would you believe 90.6 million? I was rather surprised to discover there were so many. What about 8 by 8 word squares (given there are 12,317 8 letter words in the wordlist)? would you believe 0? It turns out it gets much harder to find word squares as you increase the side length. I'll display some of the word squares and other stats before I display the python code I used to generate all these things further down. How many word squares are there? I counted how many word squares there are for each side length. I was suprised how many there are for 4x4 squares, but then there are no 8x8 squares or higher. The No. of words is how many words of that particular length occur in the wordlist. 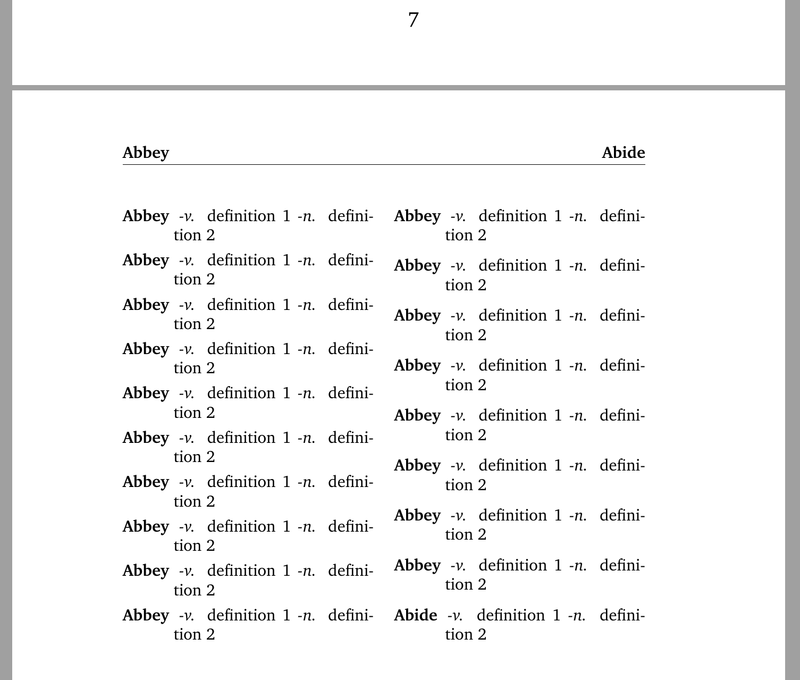 I identified two wordlists which I might use: the scrabble dictionary, and googles billion word corpus. Unfortunately, the scrabble dictionary has so many weird words I've never heard of before, and google's dataset has a heap of misspellings and gibberish. To get my wordlist I found the intersection of the two, with the hope being that the result will be just reasonably common proper English words.